Start off the month by topping up your kids’ (and your own) historical knowledge with Museum of London’s Who are the Lousiest Londoners. In this self-guided summer game, families create their own top trumps-style cards and pit London’s historical inhabitants against each other. Cockneys or Romans, who will come out on top in this battle for the ages? Free game packs are available throughout August; ask a member of staff for one when you arrive at the museum. Encounter more historical creatures at Dinosaurs in the Wild, a unique opportunity to take a trip even further back in time: 67 million years to be exact. A combination of immersive theatre and educational experience, the show uses animatronics and real actors alongside 3D film to recreate T. Rex and friends in their natural environment. Visitors move between research labs, where scientists study various aspects of dinosaurs’ biology and behaviour. And, if you’re brave enough, you can even venture ‘outside’! Dinosaurs in the Wild is open to the public until 2 September, and is aimed at children ages five and older. If you don’t fancy being stuck inside, why not try one of the many outdoor film screenings happening throughout London this month? Luna Cinema’s family friendly offerings include the original Jumanji, current feelgood favourite The Greatest Showman, and that magnificent evergreen that is Spice World the Movie. Alternatively, check out the Nomad Cinema, who donate all their profits to charity, for movie-going with karma points, or the free film screenings that are part of London Bridge City’s summer festival. August is not just a good month for the big screen, but for stagey outings as well. During Kids Week, children under the age of 16 can get a free ticket for many West End shows when they are accompanied by an adult buying a full price ticket. Not every show is available with Kids Week promotion, but there should be something of interest for all ages, from Aliens Love Underpants for the little ones to School of Rock for older kids. Many theatres also host workshops to accompany their shows; examples include an acting masterclass with Phantom of the Opera, and a Thriller dance workshop. Despite what the name might suggest, Kids Week actually lasts for the whole of August, so there’s plenty of opportunity for little drama queens and kings to get involved. 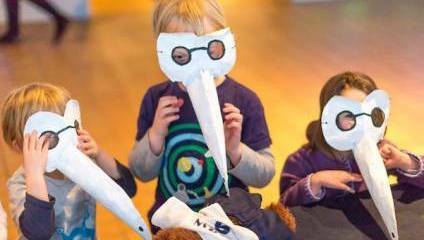 More theatre fun can be had at the National Theatre, where children aged three to eight can join Star Seekers Alph, Betty and Gammo on their space explorations. In this interactive show, the young audience members help to decide the storyline, while the actors improvise and sing their way past planets, solar systems and shooting stars. The Star Seekers runs from 8 August to 1 September; adult tickets are £12, and under-18s tickets are £10. If you haven’t quite had your anti-gravity fill just yet after that, head to Merchant Square for a spot of free canal zorbing. An explanation for the uninitiated: zorbing involves stuffing yourself into what is essentially an oversized, see-through beach ball, and running around in it to make it move. And if that’s not exciting enough in itself, in this case, it all happens on the waters of the Grand Union Canal. Find your inner hamster on 9 and 10 August, between noon and 9 PM. The week after, the National Maritime Museum is hosting a series of family photography courses inspired by their Great British Seaside exhibition. Each day-long workshop is centred on a different aspect of photography. You will learn how to use the camera’s settings to get the best possible results, visit the exhibition to find inspiration for your own work, and go home with a set of images. The workshops are aimed at children between the ages of eight and thirteen; tickets are £60 for one child and one adult, and £30 for each extra family member. Cameras can be hired on the day for £5.